So of course, that’s exactly what happens. Severely damaged, Serenity and crew slip their attackers and land on an out of the way moon named Bethlehem. In need of repairs and short on cash, all there is to do is find a job, fix their boat, and get away before the Alliance warship comes back around for another go. 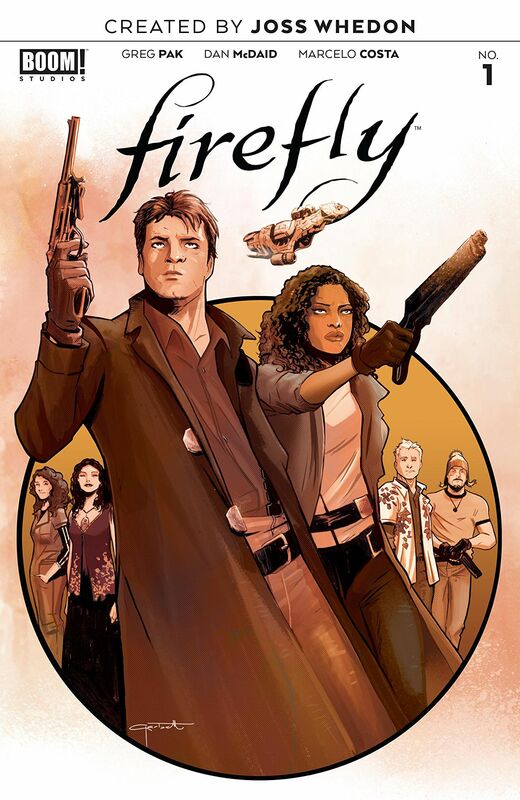 Full disclosure, I’m more than a little ashamed to say that I missed Firefly on its first televised run. Without pointing any fingers (cough… looking at you, Fox), the show was just too tough to track down and by the time I’d really caught wind of it, it was already off the air. Its schedule seemed to change from week to week, and unable to get its footing Joss Whedon’s sci fi western went away far too soon. Since then, thanks to word of mouth and a release to home video, the travels of Serenity and her crew have moved beyond the realm of short-lived television series into that of cult classic phenomenon. 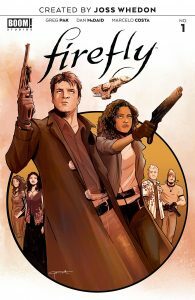 Since the show’s inglorious demise, it’s had a successful motion picture that wrapped up a few of Whedon’s intended plot threads, and a popular series of comicbooks from Dark Horse Comics. Continuing its life on the sequential art page, Firefly has come to Boom! Studios for the next leg of its journey to full blown legendary status, and having read the first issue I couldn’t be happier. 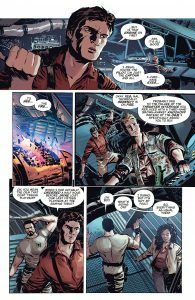 While I’m sure that there are going to be a few fans out there determined to stick to established continuity, writer Greg Pak looks to be going for a “soft reboot”. 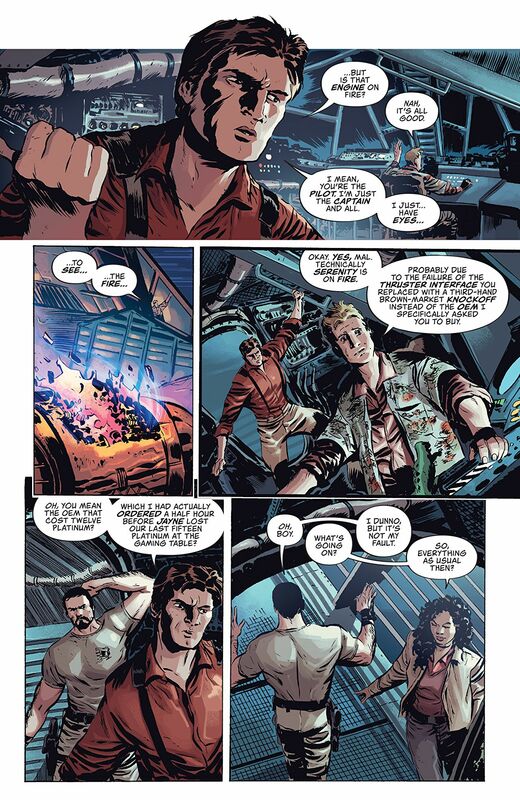 In Firefly’s original timeline, there really isn’t a lot of time to play around with to continue the adventures of Serenity, seeing as two of her crew are no longer with us by the end of the movie. In any event, the Dark Horse series did a good job of picking up where the movie left off, so that’s not exactly new territory. Pak, under the scrutiny of Joss Whedon himself (allegedly keeping a hand on the creative rudder of his labor of love), has hit the rewind button and brought the much loved- and missed- Wash and Shepherd Book back to the land of the living. Their untimely ends may still loom on the horizon, but we’re going to have at least a little more time to spend with them before they go. From what I’ve seen so far in this first issue, this can only be a good thing. 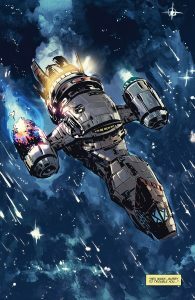 Greg Pak has done his homework, whether that’s as a writer or a fan, and is paying full attention to what I think makes Firefly such a lasting thing. Simply put, we love these characters. Joss Whedon created some of the most memorable, honest, and broken people I’ve ever seen on screen or page. Pak has done an admirable job of picking up all of those threads and weaving them into his story. Wash “sounds” like Wash. Mal sounds like Mal (I swear at one point you can hear Nathan Fillion’s voice crack in exasperation as he leads his band of misfits and ne’er-do-wells). Everything fans have loved about these people is there, with the added bonus of shifting the focus of the story from that of River Tam- a story well told- to Mal and Zoey. It looks like we’re going to be able to explore their history, going back to the Unification War. 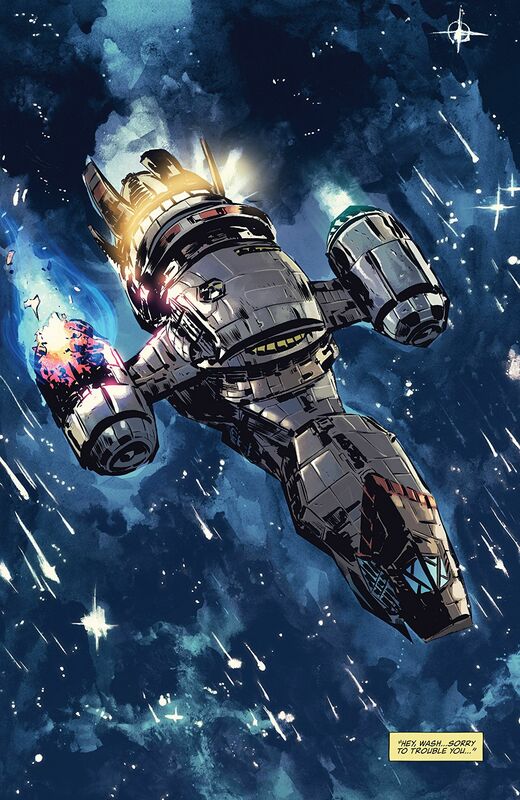 The artwork, more than ably handled by the team of Dan McDaid (illustration) & Marcelo Costa (colors), looks to be more than up to the task set ahead of them. From Wash’s control console (complete with plastic dinosaurs) to the pretty floral trim on the door in the crew’s dining area, McDaid & Costa have recreated one of the most iconic settings/ships in fiction- sci fi or otherwise. Some would argue that Serenity is a fully fledged character in her own right, and it’s awesome to see the attention to detail given to keep her personality intact. Also, McDaid’s work on keeping the characters firmly in touch with their established looks is nothing short of miraculous. Everyone is pretty much left exactly who they are, from clothes to body language and attitude, which should go a long way toward easing any butthurt raised by purists over a slightly fudged timeline. They’ve done the impossible, and that makes them mighty. I could go on, but eventually I’m going to start sounding like I’m on somebody’s payroll and this is more of a paid endorsement than a review. 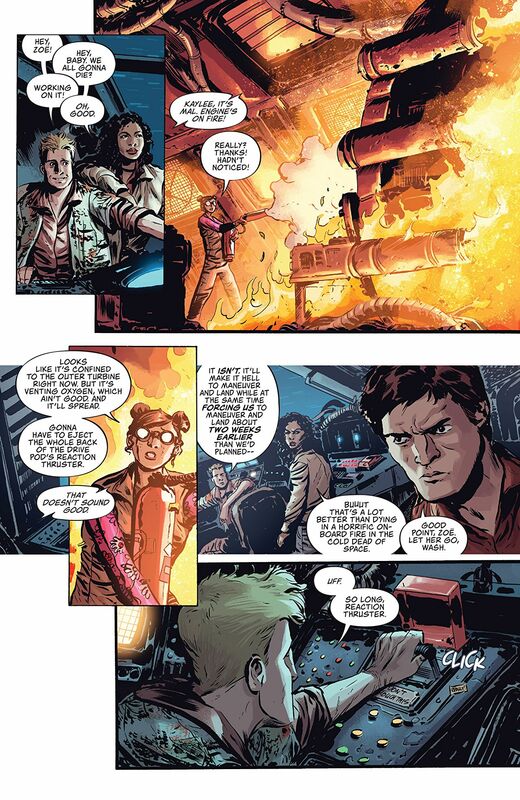 I’ll end it here, and just reassure the Browncoats out there that everything they’ve loved about this series and the universe it inhabits has been left firmly in place. Sure, there may be a few hitches along the way, but that’s an infinitesimally small creative price to pay to see more from this ship and crew.